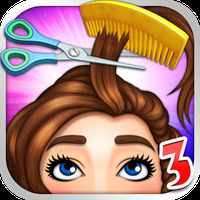 "Download and have fun with a game of hairdressers!" Game Goal: All girls passionate about fashion, can't help but download Hair Salon - Kid Games, a game for children in which every girl can become a talented hairdresser. How to play: You must choose the models and start the transformation, using your creativity and the equipment available to create an amazing and unique hairstyle. Graphics: Though not one of the best, the Hair Salon graphics work well for the game purpose. Hair can be straight or voluminous, but the options offered ensure good fun. Controls: To create hairstyles, drag the right tool for the customer: flat iron, hair dryer, scissors, dye, etc. Content Classification: Free classification. Fun mainly for girls who love to innovate and create new hairstyles. Platform: It can be installed on any device with Android technology. Useful Tips: Once finished with the hairstyle, you can take pictures of the model and share it with friends. Installation requirements: A minimum of 31.62 MB of free memory space and Android 2.3 or higher. Rating: The TOP 10 Most popular games in Make Up Games category. Ranking: The TOP 1 Most downloaded games in Make Up Games category. Saves images of the hairstyles made, directly in the gallery. Several functions: cutting, coloring, straightening, curling, among others. Excess advertising interferes with gameplay. Some security apps accuse this game of being adware. The game only has 4 characters. Do you like Hair Salon - Kids Games? Apply the best makeup and win the contest! Anything can and will happen at the beauty salon!